Well, nearly. After Force India's announcement of the end of their engine deal with Ferrari, Vijay went on to say that Colin Kolles and Mike Gascoyne are leaving the team. This is not a complete surprise, given that rumor had it that prospective drivetrain suppliers, McLaren/Mercedes, are not all that keen on working with Colles, but the departure of Gascoyne must surely raise some eyebrows. Memories of Toyota's loss of performance after getting rid of Gascoyne must surely surface. Having said that, it must be added that Mallya seems to know what he is doing. Much of the credit for the team's improvement this year has gone to Gascoyne, deservedly so no doubt, but he is known to be a difficult personality to work with, even if that is largely because he does not sweeten the pill of bad news for his employers. We should remember the stories this season of discontent and strife in the Force India camp; it may be that Mallya has decided that a team that works together may be more effective than one in constant conflict. That remains to be seen, of course. Vijay will be taking over the direction of the team himself while Mark Smith and James Key are responsible for the design of the cars. It says much for Mallya's enthusiasm and confidence that he is willing to take the project on and I would not bet against him. The survival of Colin Kolles through three changes of ownership of the team has always been a bit of a mystery to me. Although the failure of Midland and Spyker was not entirely due to Kolles' team leadership, it remains a question mark over his abilities. The strife within the team this season was, perhaps, the deciding factor in Mallya's decision to do the job himself, it being the team manager's task to ensure that employees work together in harmony. It was a brave choice, in my opinion. There will be some expectation that Force India will fail this season without the expertise of Gascoyne but we should remember that the core of the team is still the Jordan employees who are not entirely unacquainted with success. The day of the lone engineer has passed and there are no miracle workers left. The time it is taking for Ross Brawn to have an effect at Honda is abundant evidence of that fact and Mallya may be correct in thinking that the effective working of the team is more important than the brilliance of one engineer. It will also be the first time that Mercedes have supplied engines and drivetrains to a customer. That in itself will be interesting to watch, especially as word was that Force India's Ferrari engines were not quite the same as those enjoyed by the factory team and Toro Rosso. Somehow I suspect that Mallya is likely to get a fairer deal from Mercedes - you may call that bias on my part, if you wish. So there are big changes at Force India for next season. Personally, I hope they work for the team and that they will be able to score points this time around. I did find it a little odd that they dropped Gascoyne, he seems to have good ideas on how to make a decent enough car and seems to be able to choose the right times to gamble on strategy. Though like you say he does have a reputation of not holding anything back when he disagrees with something inside the team. When I first read the news I almost thought that the deal may be going further than just a drivetrain share, I know only Torro Rosso and Super Aguri had the dispension to run customer cars until the end of 2009... but we've also had rumours that the cost cutting could bring this (or a varient of it) back into favour. It would appear that ViJay is stepping up and taking the ultimate responsibility for the teams performance. That's probably a good thing. On the other hand, I worry that he really doesn't know that much about the finer points of F1 and is working from an attitude of "I'm a wildly successful businessman and all this team needs is business-like approach and all will be well." I hope that's not the case. I'm disappointed that Gascoyne was let go, but glad they got rid of Ferrari. I hope the Mercedes deal is good and Force India has a fine season (it would be a good start if the car didn't have so many failures). I don't think people know how important for Formula 1 it would be to Mallya to be successful. I was really looking forward to see what Gascoyne could do with a competitive drivetrain. I expected Kolles to go because there was friction between them but it never crossed my mind they would get rid of Gascoyne. To me that is a huge mistake as he has improved every team he has been with. Look where FIF1 was this season compared to last under his technical direction. With a low budget he halved the gap to the frontof the grid. I hope FIF1 don't suffer like Toyota did when he left there. 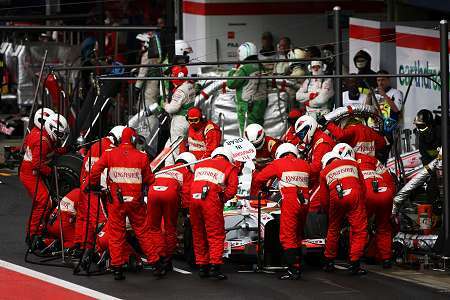 The FIF1 management structure is mosre suited to F1 than the corporate Japanese system and there are good technical guys left at Silverstone. I guess the big question is where the rottweiller goes next. Dave: I think Force India's facility for chassis design is their most important asset. Mallya needs a car that he can describe as Indian and a customer chassis would not cut the mustard. So I don't see FI becoming a customer team, even if FOTA agree on how to allow teams like Toro Rosso to continue as they have been. STR are unlikely to become constructors, however - the cost required is just too much. Some sort of compromise will be reached before 2010, I'm sure. Either that or STR will disappear - no one will buy the team if customer cars are not allowed. Filipe: I agree that Mallya's success is very important to the future of F1. India is the next great source of F1 fans and it is a potentially huge market for the sport. Here's hoping the McLaren association works for Force India. Steven: Interesting question. It may be that Gascoyne has built too much of a reputation for himself - two teams that asked a lot of him but ending up sacking him. That may be too ominous a record for other teams to touch. Mike Gascoyne said when he joined Spyker that it would be his last team in F1. I think he'll be concentrating on boats now. Ah yes, I have a vague memory of Gascoyne mentioning his interest in boats back then. Thanks for reminding me.